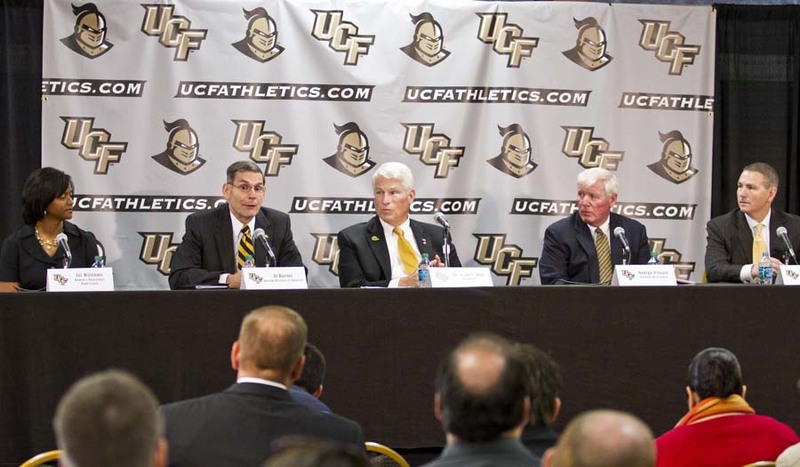 UCF’s long journey to joining a conference that will allow its athletics teams to compete at the highest level came to a joyous culmination when the Knights officially accepted a bid into the BIG EAST Conference. And on Thursday came a celebration that left school president Dr. John C. Hitt smiling, head football coach George O’Leary excited about being in an automatic-qualifying league and basketball coaches Donnie Jones and Joi Williams eager to compete in the nation’s most powerful conference. The Knights’ all-sports bid into the BIG EAST will be for the 2013-14 school year. Joining UCF as new all-sports members are Houston and SMU, rivals previously in Conference USA. Boise State and San Diego State are joining as football-only members, and Big East Commissioner John Marinatto left open the possibility of the league expanding to 12, 14 or 16 football-playing schools. UCF’s football program, which started in 1979, is still relatively young. Dr. Hitt helped take the program from Division I-AA to the top division, now known as the Football Bowl Subdivision, in 1996. He said Thursday was easily one of the most important landmarks in school history. Interim Director of Athletics Al Harms described moving to the BIG EAST as an “incredible opportunity” for UCF’s student-athletes because of the conference schools’ diversity, locations across the country and overall excellence. O’Leary, who hired Ted Roof away from Auburn as his new defensive coordinator on Thursday, can now hit the recruiting trail with the trump card of being affiliated with a Bowl Championship Series league. The prospect of someday getting into a league such as the BIG EAST is one of the factors that drew Jones to UCF. He was highly successful last year in his first season with the Knights, beating Florida, Miami and USF. And his squad proved its readiness for the BIG EAST in late November by beating fourth-ranked and defending national champion Connecticut. But as Jones pointed out, 13 of the 16 teams in the BIG EAST have played in the Final Four, and just last spring eight squads reached the NCAA Tournament. Jones knows that UCF has to be ready for elevated levels of competition. Williams, who has guided UCF to two Conference USA titles in the past four years, knows that her program will be severely tested in a conference that is considered the most powerful women’s basketball league in the country. The Knights will get a taste of what’s to come in the upcoming weeks with big games against Virginia Tech (Dec. 18 at UCF) and at Notre Dame (Dec. 20). UCF’s arrival into the BIG EAST now ensures that a UCF-USF yearly series will take place in all sports. The Bulls will appear on the Knights’ schedules starting in 2013. O’Leary has proposed for years that the UCF and USF football squads play a regular-season-ending game each year on the day after Thanksgiving. Such a game, O’Leary said, would assuredly sell out Bright House Networks Stadium in Orlando and Raymond James Stadium in Tampa and breathe enthusiasm and passion into the two programs. With the conference now stretching west to San Diego and Boise, Idaho, conference leaders stress that the width and breadth of the league is a major selling point when negotiating television contracts. Marinatto said on Wednesday that because the BIG EAST has teams in four time zones, that it will be able to offer networks the ability to broadcast games all day and night without overlap. Dr. Hitt also said the size and configurations of the BIG EAST will help when it comes to future media deals. He said that the annual income generated by UCF’s entry into the BIG EAST could generate a range from $5 million to $15 million for the school. Of the schools now in the BIG EAST, 10 are in the Top 20 media markets in the U.S. and 14 are in the top 35 markets. Orlando is the 19th largest media market, and UCF’s enrollment of 58,587 students is the second largest in the country.